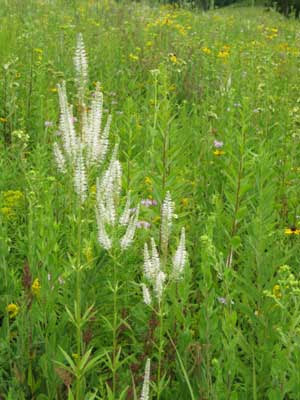 Culver's root (Veronicastrum virginianum) is a "strikingly handsome" plant that seems to have a wide range of habitats. At Pleasant Valley Conservancy we have it growing in wet mesic, mesic, and dry mesic prairies as well as oak savannas. Also, we had a native population along the cool, north-facing side of County Highway F. Most of our seed came from the County F site, although at this late date it is hard to tell whether the populations we have growing in the savannas arose spontaneously or came from seed we planted. This year for the first time we have a large amount of Culver's root in the Valley Prairie. Since this prairie was planted in November 2002, it is now in its 6th growing season. We did have Culver's root in the Valley Prairie last year, but only scattered, so it does seem to take quite a bit of time to become established. The seeds of this species are extremely fine, which means that in a seed mix they often settle to the bottom of the bucket. However, we take care to ensure that the seed are well mixed before planting. The fact that it is distributed widely across the Valley Prairie suggests that we did a fairly good job of mixing. 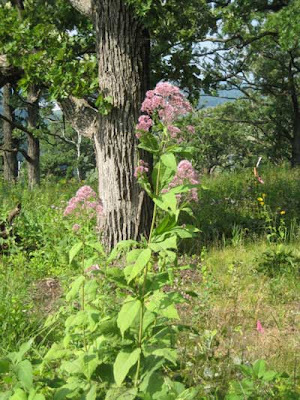 Upland boneset (Eupatorium sessilifolium) is a Special Concern species in Wisconsin. We had a small native population when we began savanna restoration. Although it is found throughout eastern North America, it is relatively uncommon wherever it is. It is classified as Threatened in Michigan and Minnesota and Endangered in New Hampshire and Vermont. In our part of the country it is a savanna specialist, and is found in only a few counties in western and southern Wisconsin. Its rarity is indicated by its coefficient of conservatism of 9. The only Dane County collections at the U.W. Madison Herbarium were made in the 19th century. 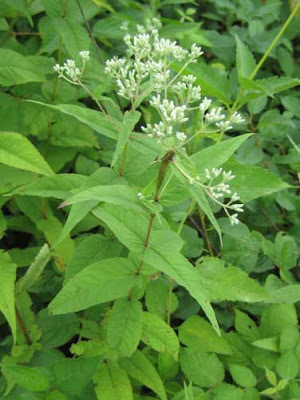 There is another species, tall bonset (Eupatorium altissimum), and the two species are often found growing together. However, tall boneset is much more common and is found in dry and mesic prairies as well as savannas. We have lots of tall bonset, and although not real common in Wisconsin, it is not considered a rarity. The key difference between these two species is the leaf structure. 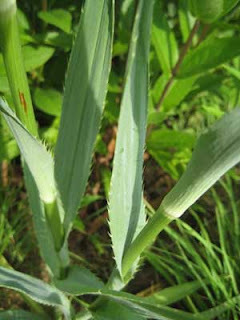 Upland boneset has a "sessile" leaf, that is, without a petiole, as the photo here shows. The leaf of tall boneset has a petiole. Initially we had only a single small population of upland boneset consisting of five plants, all in a single location in our bur oak savanna. As we have restored that area (removing lots of honeysuckle, buckthorn, and weeds) the population has gradually expanded. Today I counted 50 plants, a substantial and satisfying increase. We have attempted to establish this species at other locations on the Conservancy, by raising plants from seed and transplanting them to other places. However, seed viability has been low, and from a large seeding we have generally obtained only one or two plants for transplant. Plants that we have transplanted have done well, usually flowering the first year. One transplant made three years ago has now increased to five stems. These modest successes encourage us to keep trying. Perhaps one year we will get a good viable seed crop and will be able to get this interesting species more widely established. 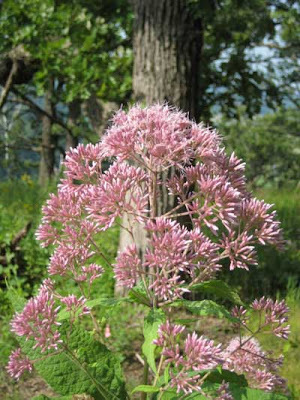 Purple Joe Pye weed (Eupatorium purpureum) is now in full bloom. This tall, handsome species is often seen in small amounts in southern Wisconsin woodlands, but proliferates substantially during savanna restoration. It is rarely seen in prairies. We introduced this species into the various savannas as they were being restored. It became established with little difficulty, but has not "taken over" any areas. The photo here is of a small stand (three plants) growing in our ridge-top bur oak savanna (Unit 10). This species is sometimes confused with E. maculatum, the common species of marshes and other wetlands. Occasionally, we find E. maculatum in a savanna, but I have never seen the reverse situation. Lots of species are now in flower, and we are not even into aster/goldenrod season yet. Although we could use a bit more rain, most of the deep-rooted prairie plants are still in good shape from all the June/early July rains. Purple prairie clover (Dalea purpurea) is one of those plants so outlandishly colorful that it is hard to believe it is a product of nature. Although primarily a prairie species, the photo shown here was taken in an open savanna area. We had purple prairie clover originally only on one of our remnants (Unit 1), and we collected seed to plant in other parts of the Conservancy. Now we find it in small amounts in most of our prairie and savanna remnants, as well as in the former ag fields that we have planted to prairie. It took about 5 years to get established well from seed. A related species, white prairie clover (Dalea candida), flowers earlier and is almost finished. It is a more robust species and forms fairly large clumps. The two species can be distinguished in the vegetative state by the sizes of the leaves. 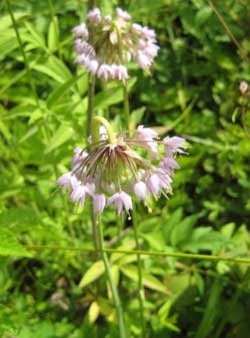 Nodding wild onion (Allium cernuum) is another prairie/savanna species that is now in full flower. According to Cochrane and Iltis, this is rare but locally abundant in southern Wisconsin, and is often found on areas with dolomitic rocks, such as ours. I see this plant more commonly in savannas than prairies, although this may be because in the prairies it may be hidden among the tall grasses. Our plants developed from seed that was brought in from another southern Wisconsin site. The third species here, whorled milkweed (Asclepias verticillata) is more common than the other two. It is native to the Conservancy and grows all over the south-facing slope. At first glance it doesn't even look like a milkweed, but a close examination of its small flowers shows otherwise. It forms small and slender pods that are definitely milkweed in structure. It is a clonal species, forming largish patches on the dry prairies. There are some nice patches in bloom right now in the road cut along Pleasant Valley Road (where this photo was taken). When we set up our forbs garden we planted all the milkweed species for which seeds were available. We were not aware of whorled milkweed's clonal growth habit and were surprised to find it spreading across the whole garden. It even sent runners under the black plastic sheeting we were using for weed control and set up housekeeping in adjacent rows. We had to knock it back by pulling all these outliers. Among other habitats, we have whorled milkweed growing right out of the dolomitic rocks at the top of Unit 6, more or less surrounding the Aldo Leopold bench. In that habitat single plants grow right out of cracks in the rock where small amounts of soil have accumulated. There it is definitely not clonal, since there is no soil for the rhizomes to spread through. Sunday, July 27, 2008, Kathie and I conducted the second of two summer field trips at Pleasant Valley Conservancy. This was for the Prairie Enthusiasts and any other interested people who may have seen the announcement on this web site. Twenty people attended, mostly from the Dane-Iowa Counties area, although we had one couple who drove down all the way from Oshkosh. 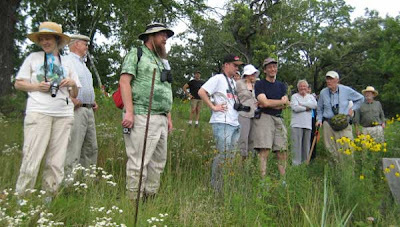 The photo above shows part of the group at the prairie/wetlands overlook. The weather was fine and the prairies (as well as the savannas) were indeed in peak condition. The absence of weeds was notable, a result of the hard work of our 5 interns, three paid staff, and Kathie and I. Keeping such a large conservancy weed free is a real challenge, especially since we are a weed-free island completely surrounded by properties with heavy weed infestations. Bergamot (Monarda fistulosa) is one of the more common prairie plants and embarrassingly easy to grow. It is also a species that hangs on well in degraded prairies and rebounds quickly once the brush has been removed. This doesn't mean that it isn't a nice plant. Right now it is in full bloom. 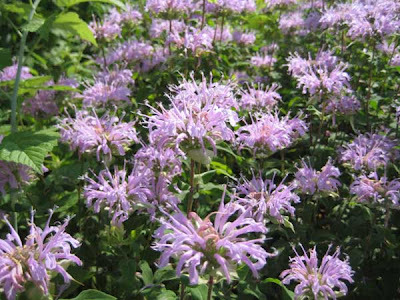 Another common name for bergamot is bee balm, and the bees do love it. It is in the mint family. When we first started restoration work at Pleasant Valley Conservancy, we sometimes had excessive amounts of bergamot showing up the first growing season after an area was cleared. However, our worry that it might "take over" was unneeded, because it soon settled down to only a nice amount. Verbena stricta (hoary vervain) is widely seen in prairie remnants but never in large amounts. It is not an especially conservative plant (that is, with a narrow habitat range), and it is also a relatively common roadside plant. (However, don't knock roadsides too much; I have seen wood lilies growing along roadsides in northern Brown County, Wisconsin.) 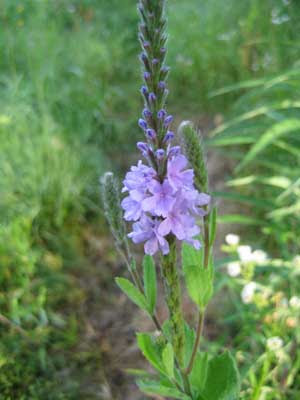 Because hoary vervain grows without much encouragement, those who value rare species tend to ignore it. 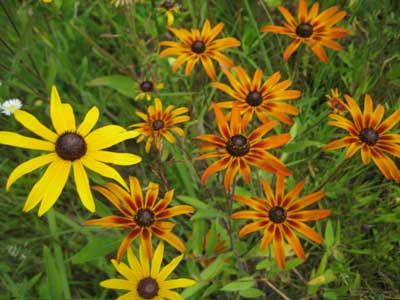 However, it is very colorful and adds a distinct accent to a prairie remnant or planted prairie. At Pleasant Valley Conservancy we find it scattered across our south-slope remnants but we also find it in virtually all of our savanna units. In neither habitat is it especially frequent, and there is obviously no danger of it "taking over", such as some other low coefficient plants might do. Although it is listed as a weed in Illinois, the Missouri folks not only like it but suggest encouraging it because of its nice color and large size. 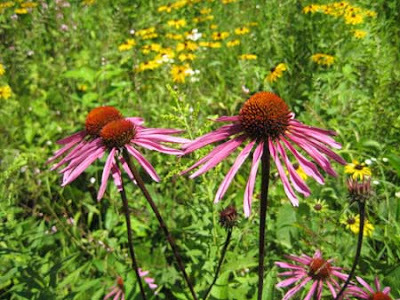 There are two species of Echinacea found in southern Wisconsin, the right one (E. pallida, pale purple coneflower) and the wrong one (E. purpurea, purple coneflower, photo at left). 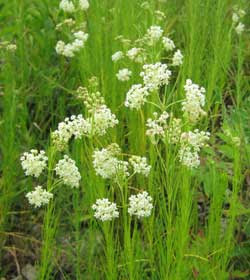 The latter is not native to Wisconsin but has been widely planted in prairie gardens and estates. It is more colorful than the pallid species, and hence favored by those who think that a prairie should be a flower garden rather than a functioning ecosystem. The UW Herbarium considered it to be an "escaped" species. E. pallida is native to Wisconsin but also restricted in its range. The Herbarium shows it in only 6 of Wisconsin's 72 counties and it is on the Wisconsin DNR Threatened Species list. We have planted E. pallida widely at Pleasant Valley Conservancy, and it is thriving in all of our planted prairies as well as in most of the savannas. I described this species in my Blog Post of 29 June 2008. However, the photos in this post of E. purpurea are also from one of our open savanna areas (Unit 11A). If this is the wrong species, what is it doing here? We definitely did not intentionally plant it. The origin is simple. It was planted at the U.W. Arboretum in the early years of the development of the Curtis Prairie, before the knowledge that this species was not native to Wisconsin. It has spread from there and now "contaminates" seed mixes thought to be E. pallida. The seed heads of E. pallida and E. purpurea look almost the same, and seed collectors are often not cognizant of the difference. The way you tell the difference is from the leaves. The leaves of E. pallida are narrow whereas those of E. purpurea are wide (see photo to left). This is important because in certain locations the flowers of E. pallida also show intense color. So when collecting seeds of this species, check the leaves before throwing a seed head into the collecting bucket. Since E. pallida is so widely planted, it is rare to see it growing as a native species. In fact, I have seen it growing that way in only one location, the Swamplovers, Inc. site off County KP west of the Village of Cross Plains. Even there its presence was a surprise. The steep south-facing bluff was cleared of brush about eight years ago and controlled burns were carried out. Almost immediately, E. pallida appeared, and has maintained large populations ever since. It had obviously existed in a suppressed state under all the brush, and thrived once it was brought out into the light. 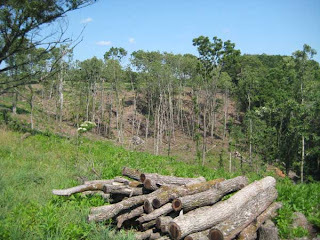 This is a dramatic example of the value of brush removal from potential prairie or savanna sites! At Pleasant Valley Conservancy we have seen a few specimens of E. purpurea in several of our planted prairies. We usually pull it out after it has finished flowering but before it starts making seeds. Eventually, we should have eradicated this "wrong" species. Denny Connor, one of our most reliable Prairie Enthusiasts, has invented a clever new technique for getting prairie plants started in the field. He creates miniature greenhouses out of gallon milk jugs. 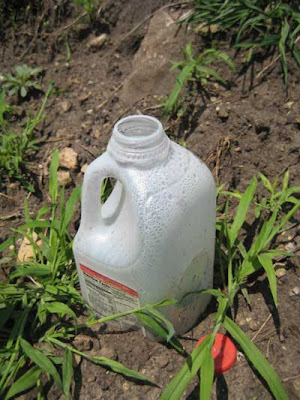 Prairie seeds or a prairie seedling are placed in the soil and covered with the milk jug. The bottom of the jug has been cut off so that the sides can be forced into the soil. The translucent plastic jug allows light to penetrate but helps retain water. Seeds germinate readily inside this mini-greenhouse, and transplanted seedlings thrive. Occasional watering is all that is needed. 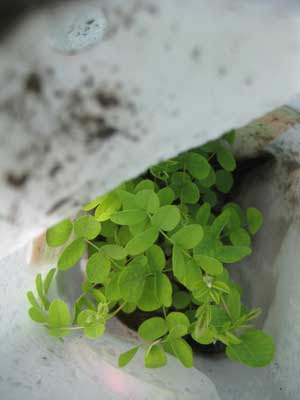 The second photo shows a thriving lead plant peaking up from the bottom of the container. Kathie had planted a tiny seedling here about three weeks before. It is obviously happy inside its habitat and has grown very well. According to Denny, this technique works especially well for early spring plantings of prairie seeds. The dome helps to retain heat from the sun, warming up the soil and giving the seeds a head start. He has used this technique for spring planting of prairie grasses, both in a garden set-up and in the field. I saw some of his milk jugs when he led a trip to prairie remnants near Indian Lake a month ago. Denny says that although he thought this technique up himself, he is certain that others use similar devices. In fact, when I used the search term "miniature greenhouse" I got lots of hits, many from commercial sources that will sell you "kits" for $15 dollars or more. However, as long as you drink milk, you have an unlimited supply of free mini-greenhouses. Gaillardia: Where did this flower come from? 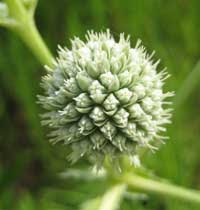 While digging Queen Anne's lace in Toby's Prairie, we discovered a "new species". The yellow flowers are black-eyed Susans, but the handsome orange flowers are almost certainly Gaillardia aristata, a garden cultivar that somehow found its way into our prairie. According to the U.W. Herbarium, Gaillardia aristata is an introduced escaped species. The word "escaped" means that the species has in some unknown fashion become transported from flower gardens to the wild, where it is maintaining itself. We certainly did not plant it, and so far we have found only this one plant cluster. Since our black-eyed Susan seeds were collected elsewhere at Pleasant Valley Conservancy, it is hard to imagine that it came from us. Of course, once a plant has set seed, you know longer have the flower color as a guide. It is possible that the Gaillardia came from the flower garden that was at one time present around the old farm house. This house has been gone since 1967, but there are still some remnants of an old flower bed. Day lilies, for instance, are present despite our determined efforts to eradicate them by spot spraying with herbicide. There is also a lilac bush and some cultivated iris plants nearby. Should we leave this colorful plant, or dig it up? We have another week or so to decide. After that it will probably no longer be visible. I have discussed in some earlier blogs the restoration work we are carrying out on what we are calling the East Basin. This is a 4 acre basin that faces south and southwest and was probably originally a prairie remnant. We cleared all of the woody invasives from this area last winter and this spring and early summer we treated all the invasive resprouts with herbicide. As the photo shows, this area, brown in the photo, remains mostly free of vegetation. It contrasts strikingly with the lush green of the surrounding land. Over the years since it had been a prairie remnant, this land had been invaded by a large number of trees, mostly elms, cherries, black oak, and aspen. We left an open-grown black oak but removed all the rest of the trees, except for the aspen which have been girdled and will be cut once they are dead. As one might imagine, there was a lot of wood here. Some of it was of saw log size, and a neighbor brought in a portable sawmill to deal with that. 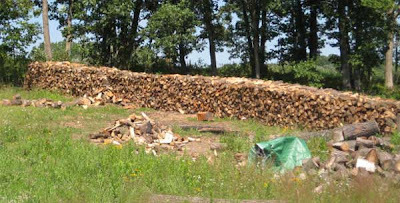 The rest of the wood was suitable for fire wood, and another neighbor, who sells firewood, has done all the hard work of cutting and splitting the wood. Although he is not finished, he has made a lot of progress, as the other photo shows. When one begins a restoration such as this, the first thing that must be done is to figure out how the wood is going to be removed. Big trees were being felled, and it is no simple task to get the wood out. In some ways, the huge snow year was a help, since we did not have to worry about chewing up the countryside with log-moving equipment. On the other hand, the snow was at times so deep that reaching the top of the hill with a truck was virtually impossible. But careful planning and perseverance prevailed, and we are now fairly well on top of the situation. Our plan is to plant this whole basin with a good mix of prairie species sometime in November. As the top photo shows, this land is pretty bare, so we don't have to worry much about getting the seeds to the ground. We will wait for frozen ground, and hopefully some light snow which will make it easier for our volunteer group to keep track of where the seed is being planted. Come back in three years and see how it looks! 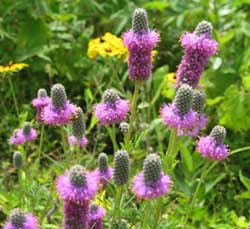 The Ridge Prairie is one of our newest planted prairies, now in its third growing season. Although we have had a few problems (smooth brome, bird's foot trefoil), we have been able to deal with them. Today I did a "walk-through" and made a list of all the species I saw. There were easily over 50 species, many flowering, the others in bud or in vigorous vegetative growth. There is lots of wild quinine (Parthenium integrifolium), most in full flower, and a number of specimens quite tall. This species is not very common in Wisconsin (it is listed in only six counties) and is on the Wisconsin DNR list as "threatened". The main reason it is not more common, I think, is that it prefers mesic conditions, and almost all the mesic habitat is under the plow. However, the Ridge Prairie does not seem like the best location for it. I am speculating that the reason we have so much of it here is that the quality of the seed we used was especially high. There is also lots of compass plant in the Ridge Prairie, although of course not flowering. Again, I suspect we were lucky with the quality of the seed used. I did find a fairly large patch of Canada thistle hidden at the far end of the Ridge Prairie. This will be dealt with (by mowing) before the end of the week. In all, I am pleased with how the Ridge Prairie is turning out. I remember well the day Kathie, Susan, and I planted it. There was 3-4 inches of snow, and it was cold, cloudy, and windy. Nice to know that all that seed we threw out is becoming established. Reed canary grass (Phalaroides arundinacea) is justly feared as a plant of wet places. However, reed canary grass is also capable of invading upland sites. In such sites it is generally fairly "well behaved", not causing major infestations. However, it does spread in these sites (its rhizomes are famous) and should be controlled. Generally in upland sites it blends in with the other grasses and leafy forbs and is often missed until it is in flower. It can still be controlled when in flower, although it is a bit time consuming. Gather the flowering stems and tie them together with a piece of grass, then cut off the stems above the tie with a sharp clippers. Spray or pour concentrated glyphosate (20% active ingredient) down the hollow stems. In a few days to a week, the patch will have died and turned brown. (See photo). The advantage of tieing the patch together is that all the stems can be cut with one swipe, saving time. 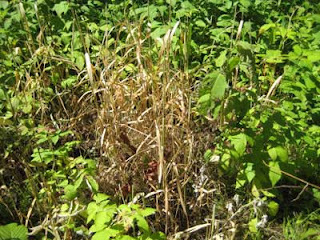 The herbicide is confined to the reed canary grass, and does not harm surrounding "good" plants. The photo shows how selective one can be if one uses reasonable caution. Black bear at Pleasant Valley Conservancy? Two reliable reports have been published about bear sightings in the vicinity of Pleasant Valley Road. These sightings are at both ends of the long ridge which includes Pleasant Valley Conservancy. One sighting, at the corner of Blue Mounds Trail and Pleasant Valley Road, was of a young adult bear, about 2 1/2 feet at the shoulder, who came out from behind the Stevenson silo, crossed the road, and went up the hill. The second sighting was at the north end of the ridge, where the bear walked right past the picture window of the Brunner house, which is on County F. At this sighting, the bear stood on its hind legs; Gordy Brunner estimated the bear at about six feet tall. According to the Wisconsin DNR, bear visitations in the Driftless Area are becoming more common. There are about 12,000 bears in Wisconsin, or which about 1800 are in the southern part of the state. It seems reasonable that this bear walked the whole length of the ridge between Blue Mounds Trail and County F. If so, he walked the whole length of the Conservancy. No sign of bear droppings on the ridge trail, but perhaps bears don't follow the trail the way deer do. I'll give a prize to anyone who can get a photo of this bear! For more details on this sighting. see pages 1 and 8 of the July 10, 2008 issue of News-Sickle-Arrow (published in Black Earth, WI). 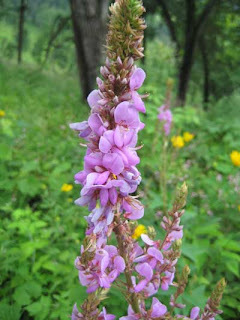 One of the showier prairie plants is now in flower: Canada trefoil (Desmodium canadense). Originally, we had a small population of this species along County Highway F, and seeds collected there, as well as seeds obtained from other sources, have been used to plant both prairies and savannas. This species has done well and is now well established throughout. Probably the best population is in the Pocket Prairie, where we usually collect seed for further plantings. 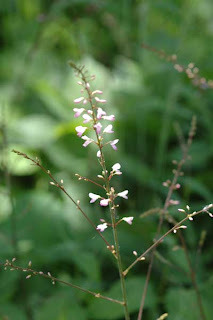 Another species, Illinois trefoil (Desmodium illinoiense), can often be confused with D. canadense. However, D. illinoiense flowers a little later, and has long leaf petioles. When we began restoration, D. illinoiense was more common, and is more widespread today. Although the flowers are very showy, both species produce annoying burs that stick firmly to clothing. Seed collecting is guaranteed to lead later to a lengthy cleaning project to remove the burs, which stick in long strings. 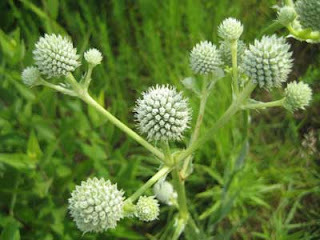 Rattlesnake master (Eryngium yuccifolium) is a "remarkable species, unlike any other in our area" (Cochrane and Iltis). A quick glance would not suggest that this plant is a member of the carrot family (Apiaceae), since neither its flowers nor leaves resemble any other members of this family (which includes Queen Anne's lace, wild parsnip, golden Alexanders, etc. etc.). The flowers give off a carrot-like odor. It has spiny, fleshy leaves, like a yucca plant of the desert, hence its species name. The common name stems from the fact that Native Americans used its root as a cure for rattlesnake bites. I have seen no evidence that this cure works. Although found throughout most of eastern U.S., it is found in Wisconsin only the southern tier of counties, where it grows in dry-mesic to wet-mesic prairies. At Pleasant Valley Conservancy it is present only in our planted prairies, where it is a minor but interesting member of the flora. In the first few years after planting, it was not common but is now more widespread, due to the fact that it self-seeds well. According to the experience at the U.W. Madison Arboretum (as documented by Theodore Sperry), rattlesnake master is one of those species that not only grow well in initial plantings but because of efficient self seeding spread widely over the planted prairie. 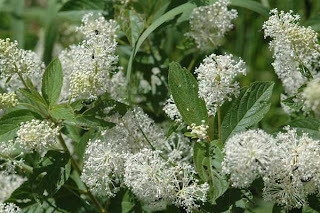 Other species (New Jersey tea, for instance) remained in its original planted location for many years. One of the tiny plants found in oak woodlands and savannas is Phryma leptostachya, or lopseed. If you look at the seeds, you can see where the common name comes from. The flowers bloom two at a time and as the seeds form they "lop" down the side of the stem. According to the literature, this species is not only native in the U.S. but also in Asia, an unusual but not unprecedented situation. Although inconspicuous, it often attracts attention because of the unique position of the seeds. 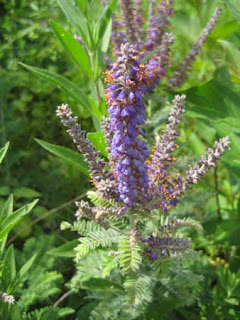 Lead plant (Amorpha canescens) is now in full bloom. At Pleasant Valley Conservancy we have remnant populations at four separate sites, two prairie and two savanna. The photo here is from our bur oak savanna. When we first starting restoration of this savanna, there was no lead plant seen. After extensive clearing of underbrush and invasive trees, and several burns, lead plant appeared. At first there were just a few small plants, and there were no flowers. As the years have gone by, the population has increased in both size and number, and most of the plants are flowering. Lead plant is one of those plants that disappears quickly under grazing. Although it is not the favorite food of cattle, they eat it readily when nothing else is available. As with many other legumes, it is a nitrogen fixer. According to the USDA National Plant Database, this species is restricted to mid America, mostly in the Great Plains. It is actually a shrub, but with annual burns it has to start each year from scratch, sending up new shoots from its perennial root stock. We have been planting lead plant at Pleasant Valley Conservancy for a number of years but it has been slow getting established from seed. We only have a few plants that we know came from seed, whereas the four remnants have many vigorously growing plants. Although lead plant is fairly limited at Pleasant Valley Conservancy, the nearby Black Earth Rettenmund Prairie has outstanding populations, which are also now in full bloom (and well worth a visit!). 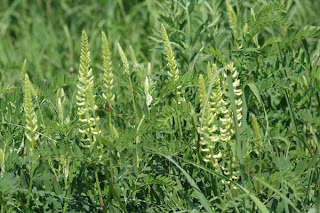 Canada milk vetch (Astragalus canadensis) is a widely planted prairie/savanna species that has an interesting spreading growth form. It grows well in the Pleasant Valley Conservancy planted prairies, but even better in our savannas. 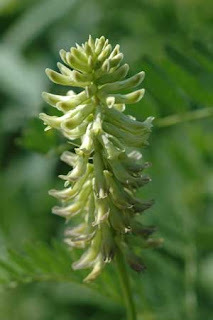 It has the characteristic leaf structure and flower of a legume. According to one site I saw, this species has poisonous components, and toxic milk may be produced by an animal that eats this plant. However, it is apparently widely eaten by native animals such as deer. Although it is found in almost every state, it is listed as threatened in a few states, including Michigan. In Wisconsin it is found mainly in the southern and western part of the state. Its coefficient of conservatism is 8, a relatively high number. Superficial observation might confuse this species with a vetch of the genus Vicia, but the vetches are climbing viney plants whereas milk vetch grows as a semi-erect plant without tendrils. 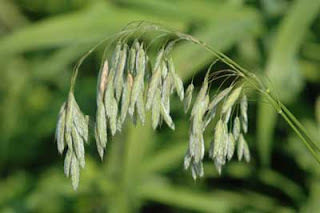 Kalm's brome (Bromus kalmii) is one of the handsome early-flowering grasses. 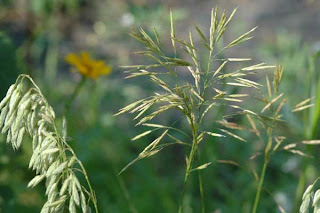 According to Cochrane and Iltis, it is Wisconsin's most common native brome. Although widespread on prairies, it is not long-lived, and tends to move around, disappearing in one place and reappearing in another. We had several small patches of Kalm's brome on our original small prairie remnant, and Kathie collected seeds which she put into the seed mixes for our first prairie plantings. It did well on both Toby's and the Pocket Prairie, and from the latter we collected a lot more seed. Since then, we have included this in seed mixes for our savanna plantings as well, and we now find it throughout all of our more open savanna areas. Kalm's brome has done extremely well in the Crane Prairie and last year we were able to collect a lot of seed for further plantings. We have three other brome grasses at Pleasant Valley, two good, and one bad. The good ones, B. ciliatus and B. latiglumis, flower later. The bad one is smooth brome (Bromus inermis), which is one of the grasses that every restoration project in Wisconsin has to deal with. It is a native of Eurasia that was introduced into North America in the 19th century and is now found in every state. One of the givens of plant ecology is that if you have a pasture or old field you have smooth brome. In many situations it may dominate a field to the exclusion of all other plants. Attempting to carry out a prairie planting without first killing smooth brome with herbicide is an invitation to disaster. Even if the field is heavily herbicided before planting, smooth brome will still be lurking and is capable of spreading and becoming re-established. When it is in flower, smooth brome is very easy to identify, and especially to distinguish from Kalm's brome, which flowers at about the same time. The smooth brome flowers are narrower and rounder; the Kalm's brome flowers are fatter and flatter. The photo here shows this difference. We have three species of Desmodium at Pleasant Valley Conservancy, illinoiense, canadense, and glutinosum. They are all starting to flower, but glutinosum (pointed tick trefoil) is first and is now in full bloom. This species is widespread in our savannas, and was one of the species we did not have to encourage, as it has spread well on its own. This is not a really showy plant, but the pastel pink color of the flower is attractive, and even though the flowers are small, they are easy to recognize. One of the problems with tick trefoil is that its leaves resemble those of poison ivy, and the two species are often found together. This is a legume, and has the characteristic legume-like flower. It also makes seeds that stick to clothing, and later in the season we will spend some time pulling the seeds off socks and pants. We have one small stand of tick trefoil that has white instead of pink flowers. I have been following that stand for the past five years and it always comes up with the same color. I assume this is a mutant and would breed true, although I haven't thought this idea important enough to experiment on. This has been a boom year for tick trefoil, and we have vast patches of it spreading across the savannas. Some of our Carex pennsylvanica patches are completely covered with trefoil plants, which is surprising, as the sedge is clonal and its dense patches usually keep other plants away. 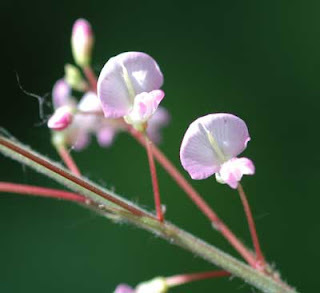 There are several other Desmodium species found in Wisconsin savannas that we don't seem to have. However, some of these are fairly similar to glutinosum and it is possible that we do have them and have just not recognized them. When you have a lot of a single species you tend not to look at it very carefully and may not realize that you are looking at something related. Right now, when all these trefoils are flowering, should be a good time to search for the other species. The word "trefoil" of course means three-leaved, and there is another plant, bird's foot trefoil (Lotus corniculata), that we also have. 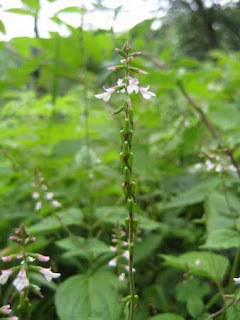 The latter, however, is an invasive weed and one we are working hard to eliminate. One of the showy prairie/savanna species is New Jersey tea (Ceanothus americana), which is in full flower now. This species is a member of the buckthorn family, and when not in flower careful attention must be paid. Once when I was spraying buckthorn resprouts with Garlon, I almost sprayed a small New Jersey tea plant by mistake. Originally we knew about this plant at Pleasant Valley Conservancy only from a large number of plants growing along our prairie roadside on County Highway F. Also, I had found a few plants in a degraded ridge-top savanna remnant. County F was our main seed source, and the seeds we collected were added to our dry-mesic prairie mix. For some years we never saw any new plants, but finally about three years ago we started to see a few small plants. Now we are starting to get more, and our best new location is Unit 23, an open bur oak savanna where the photo above was taken. 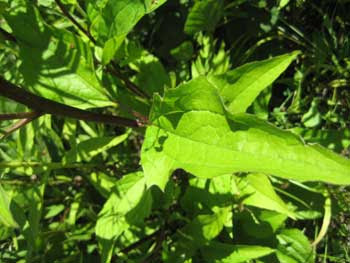 New Jersey tea grows as a small shrub, which if not burned will overwinter. Burning top-kills the plant, but it readily resprouts from the base. According to the U.S. Forest Service Fire Information Database, with frequent fires it becomes a dominant component of prairies. It has the ability to fix nitrogen, which may aid it in becoming established in pioneer situations. According to reports, the dried leaves make an excellent tea that was very popular as a substitute during the Revolutionary War. When it is flowering, New Jersey tea is easy to spot, but once flowering is over, it gets lost in the prairie herbage. We usually mark flowering plants with a bit of red tape so that we can find them again when we collect seed. Seed collection is a little tricky, because once the seed pods are ripe, they open and the seeds are lost. The seed coats are very hard and require a brief heat treatment to germinate. The procedure recommended to us was to bring water to a boil and then add the seeds, stir, and quickly strain off the hot water. The seeds are then added to the seed mix for planting. Although this procedure is counterintuitive, it seems to work. We have succeeded in growing plants in the greenhouse from seed, and they transplant well into the wild, providing they are watered well the first year. Compass plant (Silphium laciniatum) is one of the classic tall grass prairie species. At one time widespread, due to the cow and the plow it has been virtually extirpated from most of its range. However, with patience it can be readily established in dry-mesic to mesic prairies. Compass plant is noted for its deep root system and the long life span of individual plants. 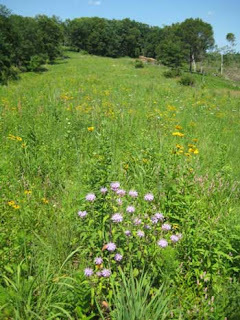 Under favorable conditions plants may flower in the second or third growing season, but prairie plantings from seed may require more years to flower. 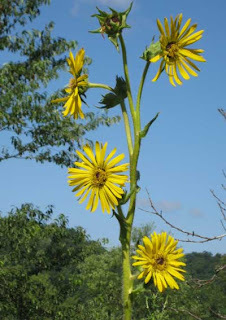 In our planted prairies, compass plant did not begin to flower until the fifth or sixth year. In the first growing season it may only produce a single leaf. The second growing season there may be two leaves, and by the third season several larger leaves are formed. During these early years, most of the growth of the compass plant is subterranean, as it sends down a very extensive tap root. Measurements made in tall grass prairies have found root depths of 9 to 14 feet! Compass plant leaves are highly dissected, and are so distinctive that even a single small leaf in a new prairie planting is easy to identify. The name "compass" comes from the idea that the leaves align themselves in a north/south direction. Perhaps, but I have found leaves of individual plants aligned in other directions as well. Because compass plants begin flowering in early July, they are often the tallest specimens in a planted prairie. 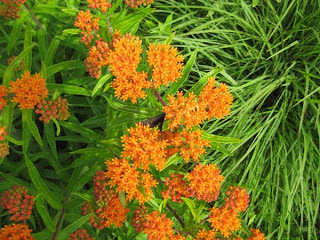 Butterfly milkweed (Asclepias tuberosa), often called butterflyweed, is one of those unbelievably handsome plants that inhabits dry prairies. The population at Black Earth Rettenmund Prairie is outstanding, and from my long work as a volunteer there I knew I wanted some at Pleasant Valley Conservancy. The year we planted the Valley Prairie we had a good seed source, and now have some nice plants. Last year I counted 25 separate plants, most of which were growing in the upper (drier) part of the prairie. I haven't counted yet this year, but there are obviously quite a few plants. This is the only milkweed without milky sap. Also, it has alternate rather than opposite leaves. Finally, there aren't many forbs with orange-colored flowers, making this species unique. Since it grows well in gardens, it can be found in many backyards. There is considerable color variation within this species. Some plants have almost red flower, most are a deep orange, but some are almost yellow in color. The color does seem to be inherited. At Black Earth Rettenmund we have almost the whole range of colors. The late botanist Robert Woodson, who was the world expert on milkweeds, did quite a bit of work on this species because of its peculiarities ( Annals of the Missouri Botanical Garden , Vol. 34, No. 4 (Nov., 1947), pp. 353-432). A fully developed specimen has numerous (as many as a hundred) flowering stems arising from a large woody tap root. Plants flower within two to three years after germination of the seed, and may persist for as long as twenty years or more. However, the do not send out rhizomes, each plant remaining as an isolated unit. 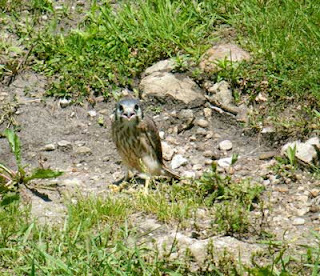 This is the second year we have had kestrels nesting in the box we installed. This nest box is near our field station so we can enjoy watching the kestrels while eating lunch, etc. A few days ago Heisley discovered a newly fledged young in front of our well house. At that time they seem very tame and she was able to get some nice photos.